Five-hundred people packed Tuesday's city council meeting. Phoenix, one of the nation's largest cities without an ordinance protecting LGBT people from discrimination, finally righted that wrong on Tuesday. The city council passed an ordinance that extended citywide protections in housing, employment, and public accomodations to cover sexual orientation, gender identity, and disabilities. 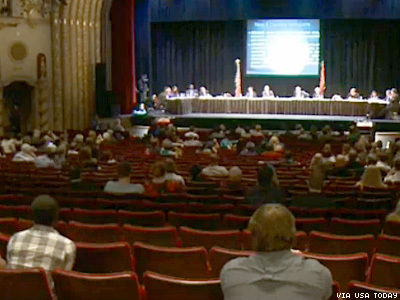 The five-hour council meeting attracted 500 members of the public, with people both advocating and denigrating the ordinance. "The issue we're facing today is not an issue of rights, it's an issue of morality," said one man during the public comments. Regardless, the council passed the ordinance by a 5-3 vote, 21 years after a similar effort failed. The ordinance allows for exemptions from religious organizations, small private landlords, senior housing, and private clubs. The current mayor, Democrat Greg Stanton, championed the change. His wife has also been a visible spokesperson against teen bullying, including the harassment of LGBT youth.